Lincoln -- Gallagher 2-1-5, Bunch 3-4-12, Farmer 3-5-13, Komnick 0-0-0, Young 8-5-21, Schrader 1-2-4, Werner 0-0-0, Heidbreder 0-0-0. Totals 17-17-55. Three-point field goals: Lincoln (4) -- Bunch 2, Farmer 2. Game 4 -- 6 p.m. -- Warrensburg-Latham vs. Mount Pulaski. 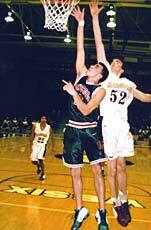 [FEB. 26, 2003] The men's and women's basketball teams from Lincoln Christian College will be involved in National Christian College Athletic Association tournaments Feb. 27 through March 1, and LCC will host the men's regional. The LCC women's team will participate in the NCCAA Mid-West Regional in Wyoming, Mich. In the opening game on Thursday, LCC will play Northland Baptist. In a previous meeting on Feb. 21, LCC defeated Northland 80-72. No. 1 -- Maranatha Baptist Bible College, Watertown, Wis.
No. 3 -- Grace Bible College, Wyoming, Mich.
No. 5 -- Northland Baptist Bible College, Dunbar, Wis.
LCC will host the men's NCCAA Regional at the Laughlin Center. Colleges represented will be Emmaus Bible of Dubuque, Iowa; Northland Baptist, Dunbar, Wis.; Marantha Baptist, Watertown, Wis.; and Moody Bible, Chicago. LCC will take on Moody Bible at 8 p.m. Friday. "True grit" is what coach Randy Kirk has to say about the Preachers. The team began the season with 20 players, but by Feb. 18 they were down to 10, due to injuries. Kirk added that those 10 were “not all healthy." He listed sprained ankles, torn meniscus and a chipped fibula as a few of the injuries afflicting the remaining team members: eight freshmen and two upperclassmen. "I am extremely proud of the efforts exhibited by these young men," Kirk said. They continued to “practice, play and improve through a tumultuous season." Despite the injuries, the team persevered for a 10-19 record in the regular season. For the duration of the tournament, the teams and their fans will be staying in Lincoln hotels. [FEB. 26, 2003] NORMAL -- In his signature classic hit, Willie Nelson croons, "I just can't wait to get back on the road again..." The song has special meaning for the Illinois State women's basketball team, which has won its last four road games, as the Redbirds head back on the road to play Thursday at Drake and Saturday at Creighton. The Redbirds, 7-17 overall, 5-10 in the Missouri Valley, finish the season with three straight road games and figure to need at least one win to earn their first State Farm-Missouri Valley Conference Tournament bid since 1998. It's been more than 14 years since a Redbird team has won five road games in a row. ISU is a half game behind Evansville (5-9) and a full game behind Wichita State (6-9). Illinois State's road success concerns opposing coaches, including Drake's Lisa Stone. "Illinois State is dangerous because they play so well on the road," said Stone, whose team suffered its first conference home loss of the season Sunday, falling 70-56 to Creighton. The Bulldogs are 13-10 overall, 8-6 in the Valley and battling to remain an upper-bracket seed in the league tournament, which will be March 6-8 in Drake's Knapp Center. The Bulldogs have perhaps the league's premier post player in senior Carla Bennett, who is No. 4 in Missouri Valley Conference career rebounding and blocked shots and No. 6 in career scoring. Her teammate in the post, junior Maureen Head, is battling back from a shoulder injury that has limited her play over the past two weeks. "She and Carla are a great one-two punch," said Stone. "But our bench has to continue to produce for us." Stone believes Illinois State's perimeter depth provides the greatest challenge of playing the Redbirds. "Illinois State has great guards," said Stone. "They all can do a lot of things. (Taren) O'Brien is versatile. Katie Donovan is a great player at both ends of the court. Jaci McCormack has had some great games lately. Stacey White can go inside or outside. We'll have to take care of the ball as well as we did last time (eight turnovers versus ISU in a 68-52 win Feb. 1 in Normal)." Yopp thinks Illinois State's character comes through on the road. "We want to be as prepared, as rested, as confident and as motivated as we can be," said Yopp. "I guess you can say being on the road has been a positive experience for us as long as we can do that. If we are fortunate enough to win and get to the tournament, I guess it's a good thing the tournament isn't at Illinois State." She wants the kind of finishes her team has provided, particularly on defense, during its conference wins this season. "The last four or five games have come down to how we played in the last four or five minutes," said Yopp. "We executed extremely well (in road wins) at SMS and Wichita State. For some reason, we didn't get the job done (in home losses) against Evansville and Southern Illinois. 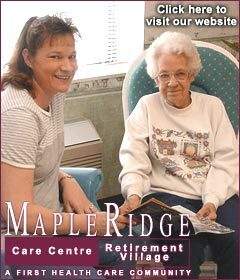 That's something we need to take care of." Sharon Blade has stepped up her rebounding of late with at least six rebounds in her last six games, a 7.3 rebounding average. ISU's starting time for the Creighton game is 3 p.m. at Bellevue West High School. 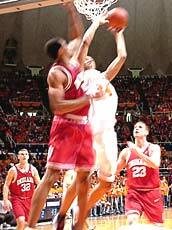 [FEB. 26, 2003] Illinois overcame hot Indiana outside shooting early and rode the trio of Brian Cook, Roger Powell and Dee Brown to an impressive 80-54 victory over the visitors from the east in a nationally televised game Tuesday night in the Assembly Hall. The victory moves Illinois to 9-4 in the conference and 19-5 overall and drops Indiana to 6-7 in the Big Ten and dangerously close to missing the Big Dance (sorry Rondel). It really broke my heart to hear chants like "N-I-T" and "Bobby's Better" coming from the Orange Krush throughout the evening. Many coaches believe there are 10 "segments" to a game, each segment marked by the media timeouts that occur at the 16-, 12-, eight- and four-minute marks of each half. If this is the case, Illinois won eight of the 10 (while tying a ninth), losing only the first "segment" by a mere three points. Early in the game, the despised Tom Coverdale silenced a crowd that booed every time he touched the ball with back-to-back 3-point baskets to give the Hoosiers an early lead. When freshman phenom Bracey Wright nailed an NBA 3 over former teammate Deron Williams, Indiana had a 9-4 lead and looked good. Indiana would make six of their first eight 3-point baskets, and the natives were restless in Champaign, wondering if Indiana would repeat an incredible performance last season in Bloomington. However, sophomore Roger Powell willed Illinois into the lead by scoring like he was Brian Cook. All told, Powell had a second straight awesome first half, scoring 16 points and helping Illinois to a 39-30 halftime lead. While many were excited with the lead at the break, conventional wisdom wondered if Indiana would answer Illinois with a strong second half. Nothing could have been farther from reality. Illinois dominated Indiana 41-24 after the break and controlled the rebounding category after the break, 24-11, as Illinois continued to extend their lead. Lincoln's Brian Cook dominated early in the second half, scoring nine quick points and keeping Indiana from ever making a run. Freshman Dee Brown again was an offensive force, scoring 16 points and committing just one turnover. --Illinois committed a season-low five turnovers, an amazing total considering the up-tempo pace of the game. --Indiana made an unacceptable 10 3-point baskets, but made just nine 2-baskets, a total reversal of the game played Jan. 18 at Indiana. --Illinois stayed out of foul trouble, committing just 13 fouls for the game (thanks go out to Ted Hillary, Steve Welmer and crew for remembering fans don't like to watch free-throw shooting contests). IU was whistled for only 15 fouls for the game. --Illinois dished out 15 assists, led by freshman Deron Williams, who had seven assists and no turnovers. Williams has really become the true point guard Illinois has lacked in previous years. --Illinois out-rebounded Indiana 41-24 and were led by Cook and Powell, who each had seven, and freshman James Augustine, who finished with six. --Illinois improved to 13-0 this season at the Assembly Hall and 38-1 in the Bill Self era. --Illinois played their third straight game without sophomore Luther Head. Self hopes to have him back for the Michigan game. --Illinois' 26-point victory was the largest victory over Indiana since the Lon Kruger era, when Illinois pounded IU 89-63 in February 2000. 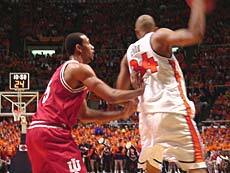 Later that season, Illinois would face IU again at the Big Ten tourney, also beating the Hoosiers on a Cory Bradford buzzer-beater, 72-69. Illinois now has back-to-back road games that will decide the Big Ten championship. Saturday Illinois heads to Michigan for an early 11:15 a.m. game and then travels to the cheese state for a Wednesday night game against the Wisconsin Badgers (8 p.m. tip). Illinois will wrap up the regular season against Minnesota on either March 8 or 9. CBS will decide by Monday if the game will be played at 3:30 p.m. on the 8th (regional game) or at 1 p.m. on the 9th (national CBS game). The decision will be between Illinois-Minnesota or the Purdue at Michigan game. [FEB. 26, 2003] I have a confession to make. I don't like Indiana very much. In fact, the only thing good to ever come out of that state to my recollection is my wife. That said, I'm free to unload. I don't know what it is. I don't know if it's the residual from the genius Bob Knight days or if it's the fact that they copied the name of our arena and called theirs Assembly Hall. It may be because they think they invented basketball or at least refined it, and that is laughable on both counts. It may be the way they look down their noses at all other Big Ten teams as if they're too good to even have to be on the same court with us. Heck, it may even be those funky stripped warm-up pants or those dastardly crimson and cream outfits they call uniforms. It might be the pitchforks on their crests that I guess spells out something about them. But, I don't like 'em. I told Brian Cook when he decided on Illinois to repeat after me: I will beat Indiana every chance I get. I think we're only 3-3 with them during the Mike Davis era, but believe me, there have been worst stretches! I tried to explain to Brian how much easier our lives will be if you pound the Hosers every time you play them just for good measure. I further stated how the world is a so much better place after a victory over Indiana and how that feeling even grows stronger and better the next morning! I mean like even though they leave the most bitter taste in my mouth any time I'm near them, it would be hard for me to feel better than I do today… and I've got huge cold and flu symptoms! Their guys just seem to have smirks on their faces that I'd love to wipe off. I have always felt that if you played them a REALLY physical game that they would wilt, and that has happened a few times. Or you see them cry and whine about everything. Right now what is circulating throughout the Big Ten is their feeling that there is a conspiracy, mostly the officiating, to make sure that last year's magical run doesn't happen again. I say the run was fluky. But, would I accept a similar fluky run by the Illini? You're darn tootin'! But that's what happens when you reward mediocrity. You let a 19-10 team into the Big Dance, they get hot for five games and the next thing you know, you're sitting in the Georgia Dome watching Opie and the boys after the Illini had just annihilated them three weeks before. It might be their fans. The reason I say this is because for years I just ignored IU altogether. And if I'm ever going to let this thing go (doubtful that could happen without huge amounts of intense counseling and maybe even shock therapy), I'll have to go back to ignoring them. Then one day I moved to Lincoln, Illinois. Some LCC student said, I know you grew up out West and that you're a huge UCLA fan, but I think you would REALLY like the Illini experience. So he took me to the "Hall." The Chief, the Illinettes, the spaceship arena, the Orange and Blue, and the best players in all the land, the Fighting Illini. I was so hooked instantaneously that it was incredible, and I will be hooked the rest of my life. But in this process of being introduced to Illinois basketball, I also had to be introduced to Indiana basketball, which may be an oxymoron! I saw people who had grown up and lived their entire lives in Illinois wearing IU colors, shirts, coats and hats. It repulsed me. I began to get physically ill and made several quick runs to bathrooms all over the state. Then, if that wasn't bad enough, I found out that LCC had a policy where they actually enrolled students from that state! The outrage! I even found out that some of the faculty and staff were from there. I called the attorney general's office to see if this was within the law. I cried when I got the results. But that was not the worst of it. It was pointed out to me that guys living in my dorm, on my floor and even next door to me where from over there! I was beside myself! These guys did do me one huge favor. They made sure that I would never be a Hoser fan. When they won, they were on top of the world. When they lost, it was a conspiracy to get Bobby. Talk about obnoxious. I'm trying to be fair here! I'm trying to show why this is NOT just another game to us, this IS THE game of the year! Even in the modern era, if they walk and chew gum at the same time, somebody has to send an e-mail to everyone to let us know of their success. Whereas, we usually quietly go about our business when we win, because we just expect to. They have fans who boo the chief and have to take their pitiful flag and try to run it up the mast with the majestic blue "I" on the orange background. The gall of those people. Several people we ran into at last year's Final Four saw our Big Ten stuff and asked if we were rootin' for the Hosers. We simply said what any faithful Illini fan would say in a similar situation, "Not in a million years!" If they were playing China for the title, I'd be rootin' for Yao Ming! So thank you, Brian Cook. Thank you, Coach Self, and thanks to the Illini. I'm enjoying the redemption I'm getting for all those years I had to suffer with all those stinkin' crimson and cream fans. But take heart, Indiana, you're STILL at least No. 3. Not in the Big Ten of course, but behind Purdue and Notre Dame in your own state.